Recently, a UK-based pump supplier was approached by a leading European chocolatier with the challenging task of adding a solids handling functionality to the pumping of its brand of famous chocolate. The pumps in question needed to handle an already troublesome medium, namely chocolate, but in this case, with the addition of 'inclusions', such as nuts and raisins. Having serviced most of the main chocolate producers over the years, Triark’s experts knew only too well that chocolate is one of the most difficult fluids to transfer correctly and that it requires an expert approach. Chocolate solidifies when cool - we eat it at ambient temperature - so it has to be kept warm, not only as it moves along the pipelines, but also through the pump. The main issue is that chocolate is ‘shear sensitive’, meaning the cocoa butter and cocoa solids can easily separate if moved too fast, which can in turn burn the chocolate. This is not something that a high-end confectionary producer can allow. Chocolate will also react the same way if the discharge pressure is anywhere over 100psi, so correct configuration of the discharge lines needs to be born in mind too. Triark Pumps’ engineers initially considered using an air operated double diaphragm (AODD) pump, its most successful pump type for chocolate-based applications to date, but the lack of a localised compressed air supply meant that a different approach was required. Unfortunately, the overall choices were limited given the need for an electrically operated pump that could run slow (due to the shear sensitive nature of chocolate), handle solids (nuts and raisins) and be heated, so that the chocolate wouldn’t cool during both the normal running cycle or when the system stopped for any reason. Having carried out extensive ‘pre-selection’ research before discussing possible options with a number of their key suppliers, the engineers identified several alternatives from the likes Alfa Laval, Grundfos and Desmi. Eventually though, and drawing upon the experience gained during a previous visit to India by Triark’s managing director, David Rozée, where he witnessed Desmi pumps in operation at a leading manufacturer of semi-finished cocoa mass, the most appropriate solution was determined. 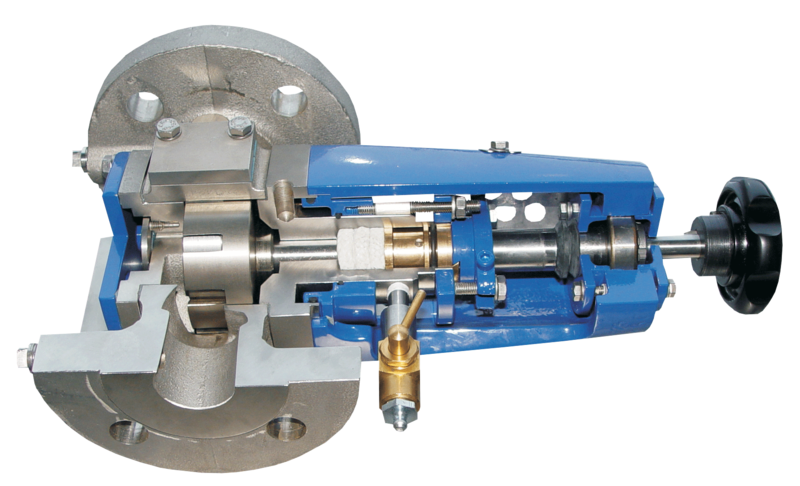 Triark supplied two Desmi Rotan 2in positive displacement internal gear pumps, comprising cast iron casing and rotor, mild steel shafts, bronze internal bearings, front and rear heating jackets, packed gland seal and secondary lip seal. Each pump was flexibly coupled to an SEW 1.5kW, IP55, EFF1 gear motor and mounted on a fabricated ‘top hat’ style stainless steel base plate, with a stainless steel coupling guard.